Easter Sunday is a day that we enjoy hearing about the resurrection. We enjoy the story of Jesus’ resurrection as well as others whom he saved from death. This power is always an attention grabber because it goes far beyond our human abilities. 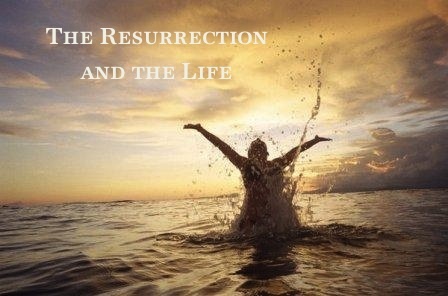 Jesus made this statement to Martha in the Gospel of St. John: “I am the resurrection, and the life: he that believeth in me, though he were dead, yet shall he live”. I know, at face value the statement doesn’t make sense. Give Martha a break because we know the rest of the story, but she lived it. She saw her brother wake up from the “death sleep” and walk among them as if nothing happened. We don’t read where Lazarus laments about being dead or that the experience was even horrible. He just takes his place among the living. I’m sure he was thankful for what happened. The question I have is that if you die once like Lazarus and you get a second chance, are you afraid of the death the second time? I mean the fear of death has to not bother you as much. For those who survived Hurricane Katrina a few years back, would they be as worried about the next big hurricane? If you have been shot before should the sound of gunfire bother you as much? If you were about to walk away from a deadly car crash, should you be afraid to drive a car or ride in a car again? I want to attempt to crack open this scripture for everyone to have a better taste of its fruit. If Jesus is the resurrection and the life (and he is), then this ability would work on everything, not just death. This understanding was given to us under the death category, but I contend that this verse is more like the master key — it fits every lock! So, If I lose my job, I am dead to the job that I lost and I can surrender this dead to the resurrection and the life (A.K.A Jesus Christ) and he will raise up (resurrect) a new job for me that I may dwell (live) in. If I lose my marriage, home, money, self respect, or mind, the Jesus who resurrects will replace the old with something new for me. You see, it was difficult for Mary, Martha and the others to fully understand the power of the resurrection. We struggle with it today as well. Let’s not limit the resurrection and life to just a wonderful biblical story. Let’s not limit God’s power to only the measure we understand. Let’s surrender everything in our lives that is dead and allow him to breathe life into it again because he truly is the resurrection and the life.